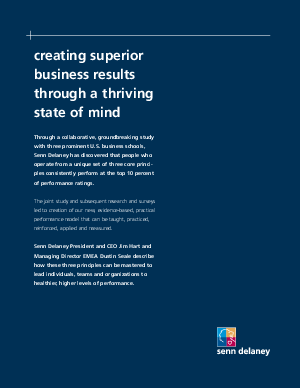 Through a collaborative, groundbreaking study with three prominent U.S. business schools, Senn Delaney has discovered that people who operate from a unique set of three core principles consistently perform at the top 10 percent of performance ratings. The joint study and subsequent research and surveys led to creation of our new, evidence-based, practical performance model that can be taught, practiced, reinforced, applied and measured. Senn Delaney President and CEO Jim Hart and Managing Director EMEA Dustin Seale describe how these three principles can be mastered to lead individuals, teams and organizations to healthier, higher levels of performance.